There was very scant information on the internet on how to get a visa for Azerbaijan. The honorary consulate in the Philippines has no authority to grant visas which means you have to get it elsewhere. One blogger used a visa service while another sent hers to the embassy in KL. Since the nearest consulate is in Kuala Lumpur, I decided to apply there. I looked up their website ( http://kualalumpur.mfa.gov.az) and sent an email to the address in the contact page. I was pleasantly surprised to receive a quick reply from one of the consuls, Mr. Eldaniz Musayev. who not only gave me the instructions on visa application but gave his Whatsapp number too. 2. I sent the above documents, 2 pcs of passport-size photos, and our passports to the Azerbaijan Embassy in KL via DHL. It was addressed to Consul Eldaniv Musayev. I inserted RM 400 (RM 200 for each of us) inside my passport. After leaving the DHL office, I sent a Whatsapp message to Mr. Eldaniv to inform him that the documents were on its way. 3. Our passports with the sticker visas were ready in 5 working days! Unfortunately, I forgot to send an additional RM 25 with my documents so our passports could be couriered back to my address. Mr. Eldaniz sent me a Whatsapp message and I made arrangements for my co-faculty’s friend to just get the passports from him as she was heading back to Manila in a couple of days. The entire process was very easy. Mr. Eldaniv was very responsive to my emails and Whatsapp messages. He updated me when he received our documents and when our passports were ready. Returned to Kathmandu afternoon via the hotel shuttle (NR 1000) from Bakhtapur driven by the most reckless and laziest driver in Kathmandu who dropped me off a few blocks before Thamel. Picked- up my laundry on the way to Avalon House which by now, has become a very welcoming place for me. Actually, feels like coming home especially with the wide smile from the elderly security guard greeting me (gotta give him a good tip when I check-out for good) each time I arrive. I got the same room (104) at the first floor. Just got settled a bit and then went off to Mandalay Book Point a block away from the Garden of Dreams. Its reputation as the most well-stocked academic bookstore is well-deserved. The store is crammed full with sgelves overflowing with books with titles in the humanities, social sciences, history, religion, Nepal, Tibet, Bhutan, and fiction. Most of the books are arranged topically. I didn’t see any shelf marked “music” the shop keeper pulled out some books somewhere. Spent about NR 5500 for 5 books, three of which are ethnomusicological books on Newari music and musicians. Jackpot! Have chrcked out the bookshops at Thamel and none handed yielded any books on Nepali music. Mpst have guide books, maps, and books on Buddhism and yoga. Had dinner at the ever reliable and ever delicious Gilingche Restaurant. 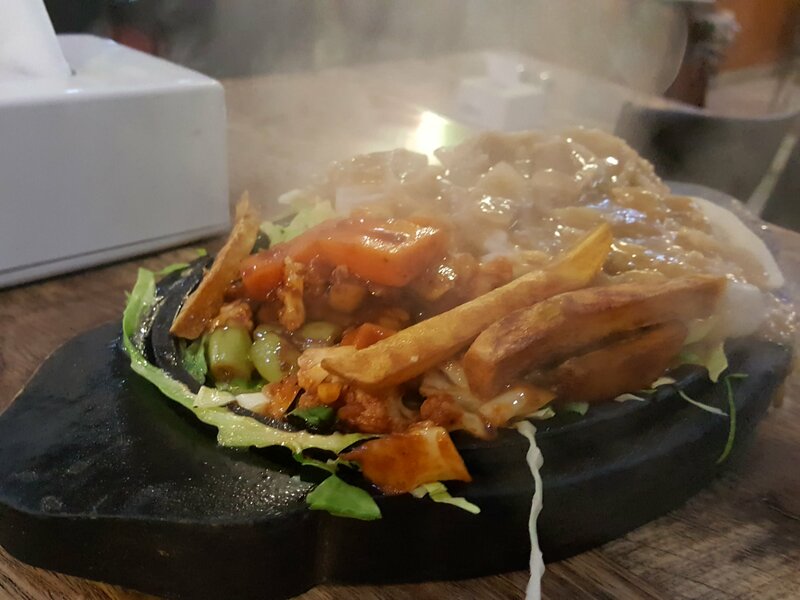 Tried the sizzling buff momo, a Westernized take on the dumplings which was topped with mushroom gravy and came with a siding of vegetables and fries all served on a hot iron plate. It’s a good way to have momo differently from the usual steamed, panfried, or deep fried. Downed a glass of lassi to help keep my acidity at bay which had been troubling me since the hike last New Year’ Day where I skipped lunch.